Sustainability at the 4UR Ranch is something we take seriously. We’re constantly looking for new ways we can reduce our footprint on our environment. The land and these resources are essential to preserve since it’s what makes this place so special for all of us. It provides us with all these wonderful activities we are able to offer our guests from fly-fishing to an excellent meal in the dining room. When making decisions, we always strive to make the most environmentally conscious choice. This year’s DRA convention stressed the importance of preserving the environment and the history of the land and the ranches. The Colorado Tourism Office encouraged all the ranches to continue practicing sustainable tourism. Every year we do all we can to preserve the land the 4UR occupies for generations to come. 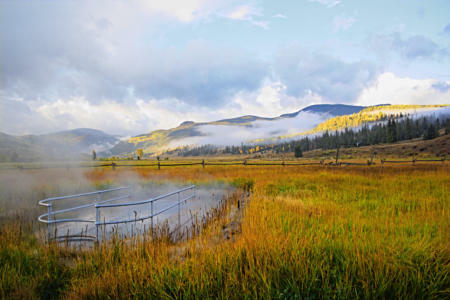 At the 4UR Ranch we are fortunate that our spa obtains its water from the natural hot springs on the ranch. Although this isn’t anything new at the 4UR, the methods and spa have been updated extensively since the original bathhouse open in 1903. 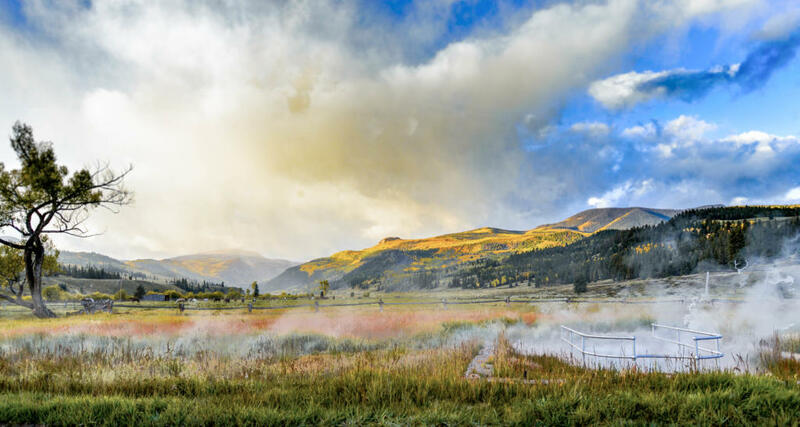 Water from the hot springs is piped down to the spa where it is filtered and circulated to keep the spa at 104 degrees. That same water that is sent to the spa is also important for the pool. That hot springs water is also used in our heat exchangers to keep the pool at 80 degrees all the way into September. Furthermore, the water is used for the in-floor heating in the whole spa building. This allows us to keep the massage area and the exercise room heated in a sustainable and efficient manner. A victory for the coffee drinkers this season is the change in our coffee provider. 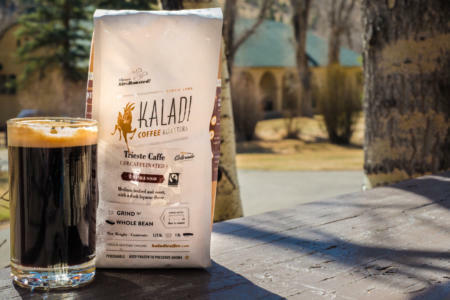 We stayed in the state of Colorado and made our supplier Kaladi Coffee Roasters from Denver. We also carefully selected our roasts and are proud to share that 3 out of the 4 coffee roasts at the 4UR this year are Fair Trade Certified and ethically sourced. There’s also one more surprise for our coffee lovers this year but you will have to wait till you arrive to see it. In regards to food, we do everything we can to buy local and support local sustainability efforts. As mentioned in our previous blog post, we have a garden that provides some of the food and spices in the dining room. On top of that, our Chefs Blake and Liz are constantly looking for ways to buy fresh and local elements for their menu. Local establishments such as Three Barrel Brewery, Halfeli’s Honey and Gosar Sausage play a large role in our dining room menu year after year. To further our efforts in conserving the natural resources at the ranch, we have also worked with the forestry department to restrict any permanent development to inside the 4UR Ranch compound. For Example the construction of the steak ride was done with a list of guidelines and restrictions . 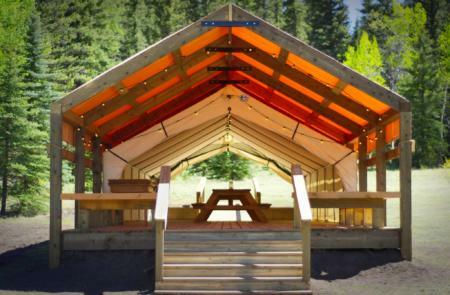 The tent had to be constructed using organic material and had to be built in a manner that is temporary. No concrete was used to set any post or pour a foundation. Lumber couldn’t be treated so therefore special measures had to be implemented to make the lumber last as long as possible without having a negative impact on the environment. At times, the restrictions provided some logistical challenges but in the end they made us adapt and we are proud of the result. A big change we made this off season in the ranch hand department was to abandon our two gas Polaris rangers. We spent some time at the co-op auction and were able to sell both of our rangers and divert those funds to new ones. After purchasing our first electric Ranger last season, we decided to purchase two more for the 2018 season. The electric rangers exceeded expectation; their ruggedness and versatility were exceptional. Most importantly, they’re silent! However, guests can now overhear our ranch hands discussing the new Taylor Swift album as they ride to their daily assignments. A small price to pay. We’re happy that we’re able to operate and work side by side with agencies that value sustainability as much as we do. Tourism is key to widening the perspective of our country and the world. More importantly, conscious tourism is paramount to preserving the story of our past so it can be appreciated by future generations to come. Season after season, we try to find ways to make this guest ranch and the environment it occupies thrive as long as possible.